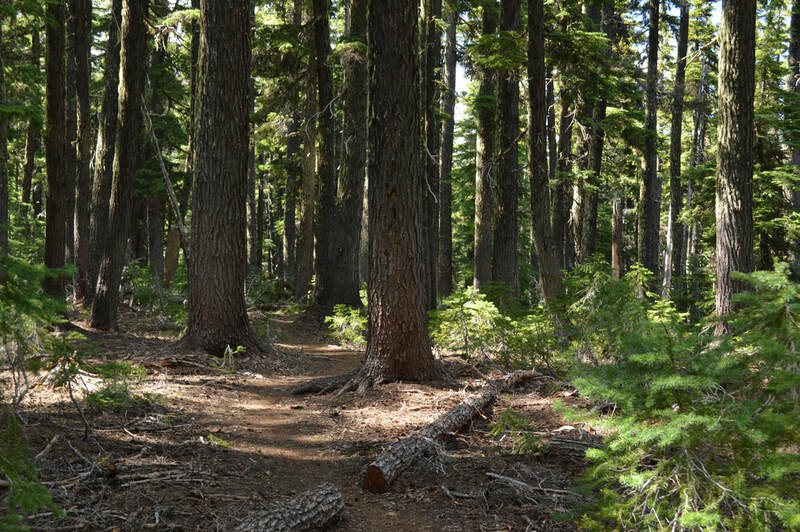 (Click here to get the printer friendly version of this hike and info on other nearby trails, campgrounds, and directions/mileage from all major cities in Oregon). 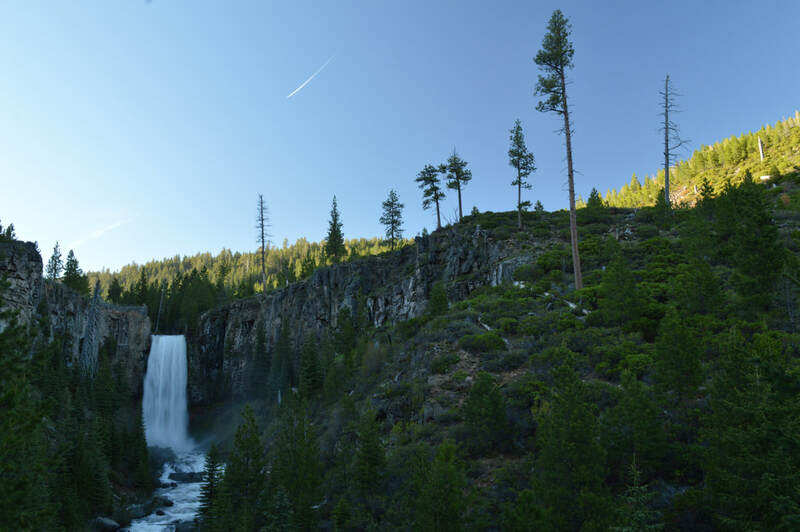 Tumalo Falls is one of the most iconic destinations in Central Oregon and for good reason. 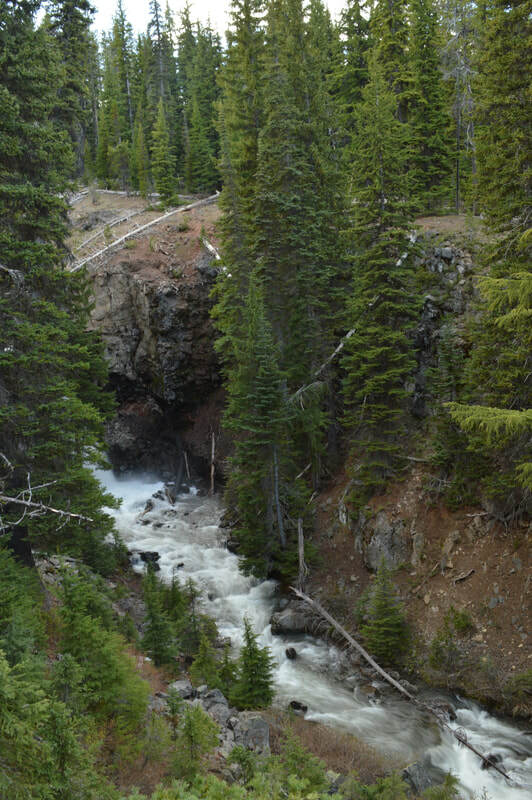 Tumalo Creek is located at the base of Broken Top in the Deschutes National Forest and this hike offers a moderate 8.2 mile loop up to Happy Valley, or you can opt to make it a 4 mile out and back hike to one of the upper waterfalls where the bridge crosses Middle Fork Tumalo Creek. 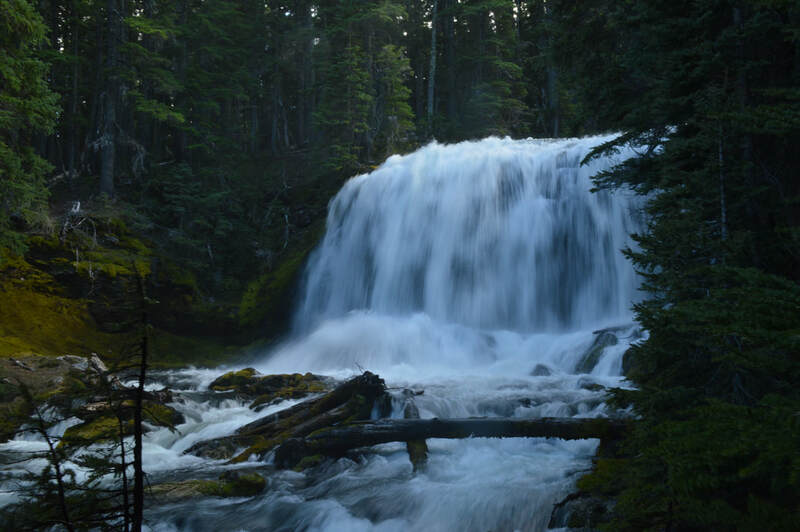 Or if you're only looking for something very short but still scenic, take the North Fork Trail 1 mile up to Double Falls. ​This hike is not only very popular in the summer, but it is also a scenic winter destination. Once the snow falls there is a gate that closes the access road to the main parking lot so you can cross-country ski or snowshoe 2 miles up to the Tumalo Falls viewpoint. The rest of the trail however, is not recommended in the winter because it is not marked for snow travel. Parking can be a serious issue here during the summer season (weekends from May through September), and often times cars are parked a good 1/2 mile or more down the gravel road. The trail starts at the parking lot right by the two pit toilets. Shortly after the parking lot, you will come to a trail split. 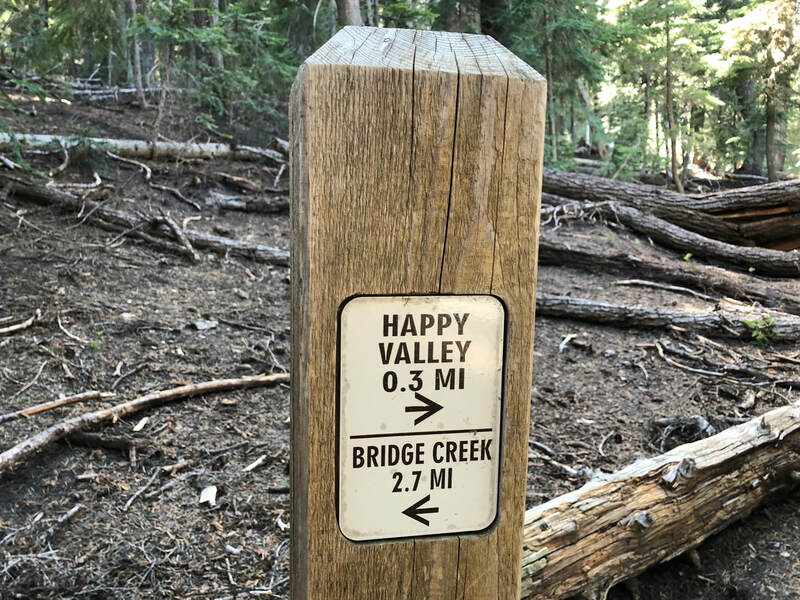 If you are hiking the loop to Happy Valley, you will take the Bridge Creek Trail to the left. Please adhere to the rule of no dogs allowed on this trail! Dogs are allowed on the other trails but must be kept on leash at all times. 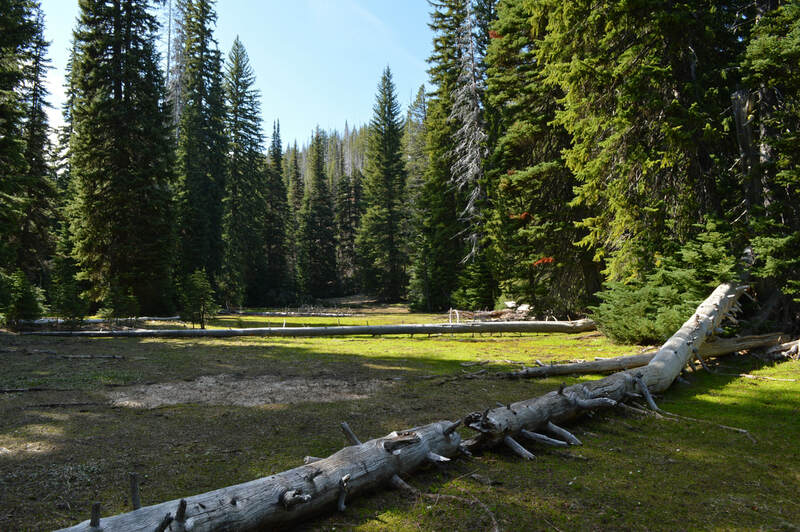 The Bridge Creek trail is less crowded and takes you along Bridge Creek where Bend gets its drinking water from. After about 1.3 miles of walking through a young forest and lots of snowbush, ignore the first trail split that crosses the creek to your left, shortly after you will come to another trail split. Here the Bridge Creek trail continues straight to Tum Lake (an option), but you will go right and take the Swampy Lakes trail. 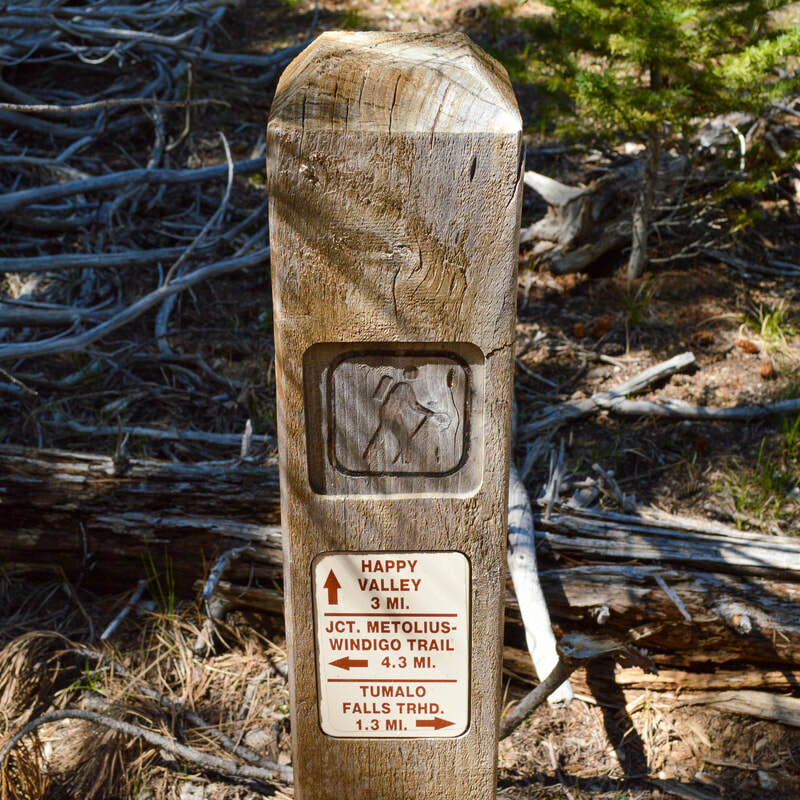 The Swampy Lakes trail takes you along an open ridge for a little while where on a clear day you can catch glimpses of Broken Top straight ahead and the Tumalo Valley to your right. Soon the trail will take you through a beautiful dense forest where in late June and through mid-July, the mosquitoes are horrendous. After about 2.1 miles you will come to a creek crossing. 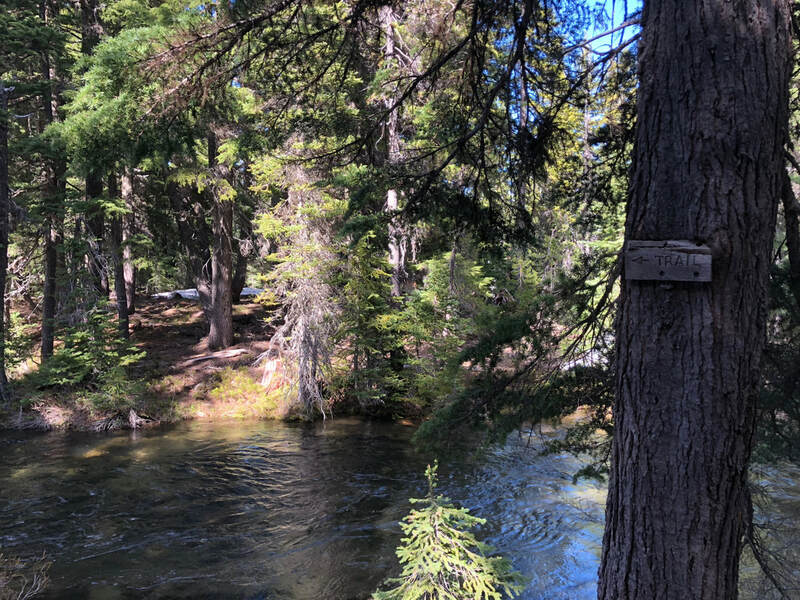 This is the Middle Fork Tumalo Creek and later in the season (late August, September, early October) you will be able to cross this creek with no issues, however early in the season (May, June, July) you might have to go up or down stream a bit to find a down log where you can cross safely. Please be careful here! This water is swift and very cold! 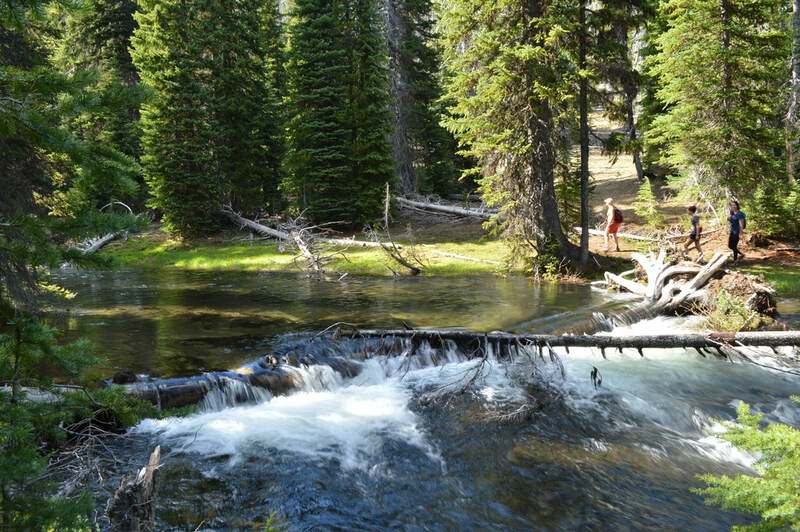 ​Once you have safely crossed the creek, it is only a few hundred yards to the next trail split. If you would like to check out Happy Valley and possibly camp there, continue on the Swampy Lakes Trail to the left. If you'd like to cut 1.4 miles off the trip, you can complete the loop and take the North Fork Trail to the right. 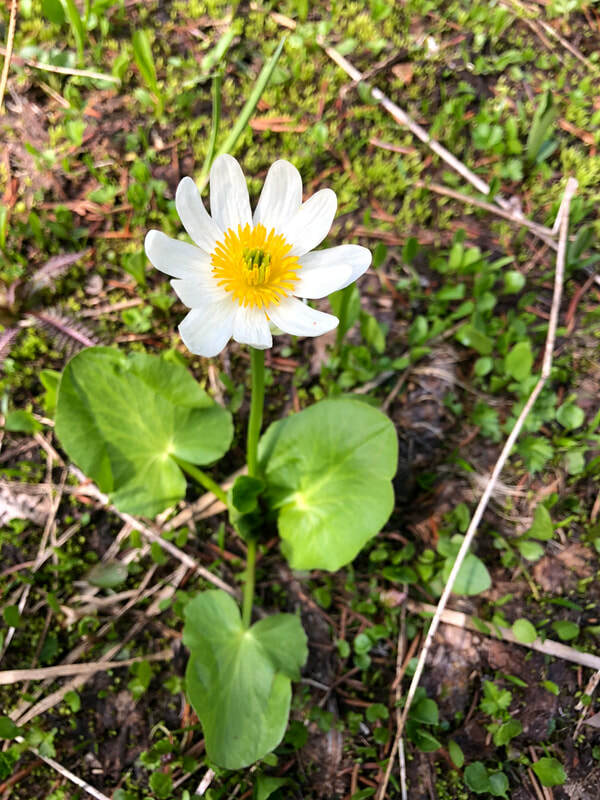 Happy Valley is aptly named and it is incredibly beautiful with lush meadows and wildflowers blooming in late May and through June. 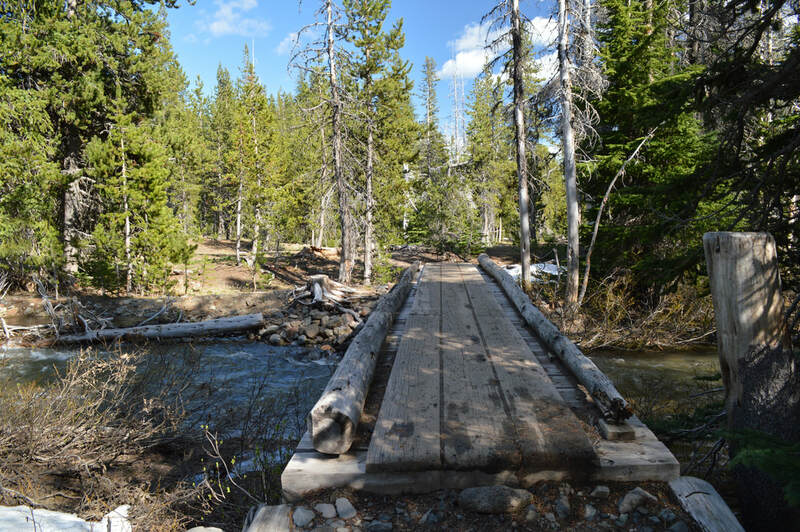 0.7 miles after the trail split there is a wooden bridge that crosses North Fork Tumalo Creek and there you will see a very large camping area. 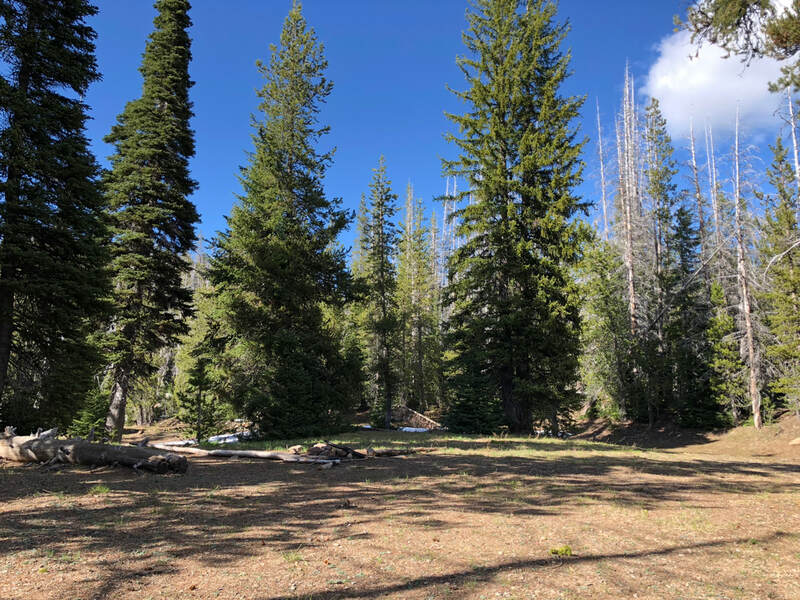 This would be a great first time backpacking trip for you and your kids, or if you're bike-packing or horseback riding the Metolious Windigo Trail which passes right along here as well, this is a wonderful large camp spot. 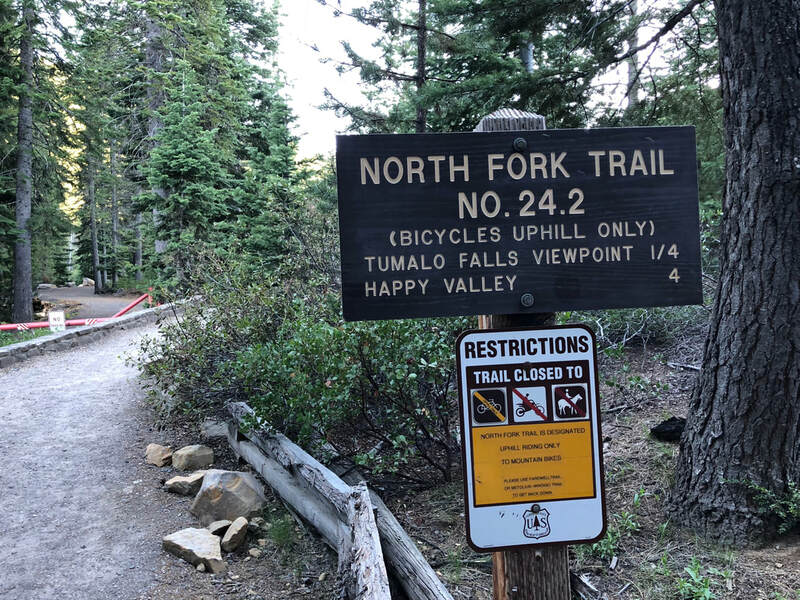 After back-tracking the .7 miles from Happy Valley back to the trail split, take the North Fork Trail to complete the loop. Here the forest gets very lush and also darker and a bit cooler if you are doing this hike in the afternoon. The trail skirts the edges of Middle Fork Tumalo Creek and here you will see a series of beautiful waterfalls that are not nearly as talked about as Tumalo Falls, the feature of this hike. 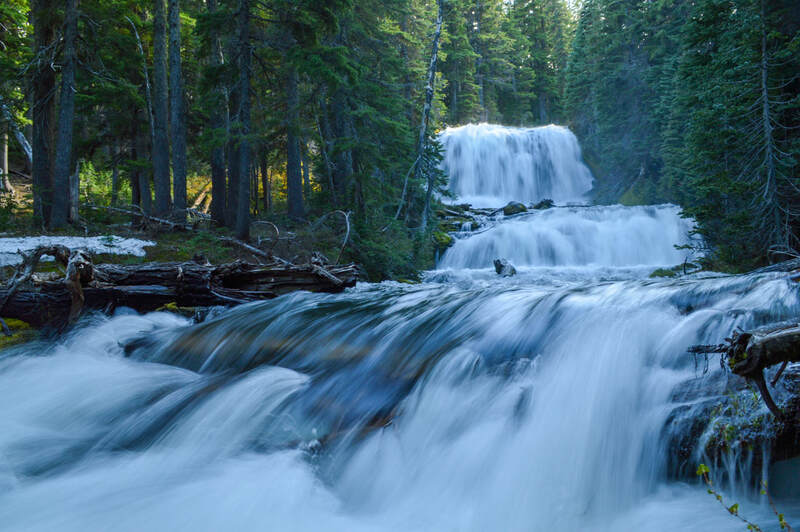 Middle Fork Tumalo Falls is especially spectacular at 53 feet tall and featuring two large and impressive drops. 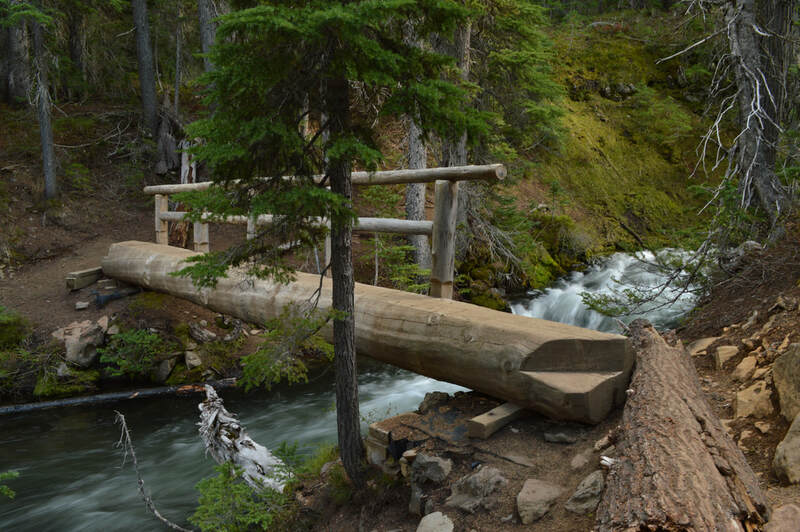 ​After another mile of hiking next to the creek, you will come to a log bridge with only one railing. If you have small children, please be careful here. From here you have about 2 miles to go until you get back to the parking lot. Here the trail gains a little bit of elevation, and you walk at the edge of the canyon, looking down about 200 feet at Tumalo Creek below. Another very beautiful waterfall is well-known Double Falls (89 feet tall), also featuring two drops with an impressive flow especially early in the season. Looking down on it, you can get many different unique angles, perfect for those folks who love taking nature photos. 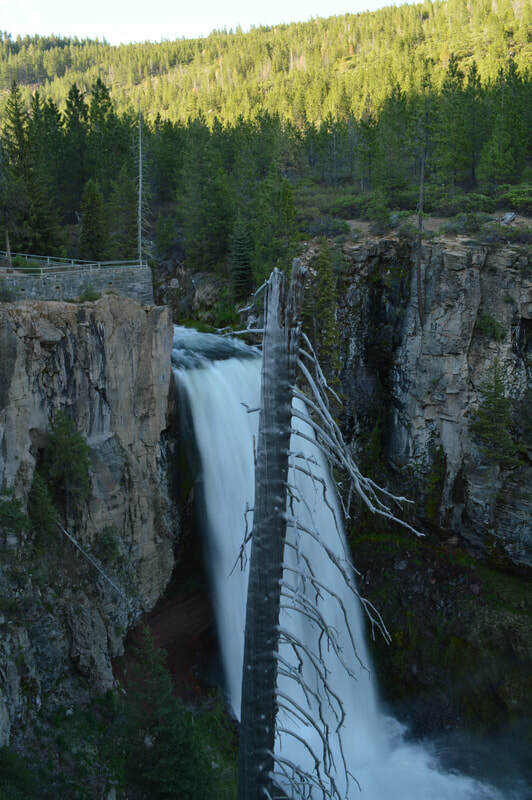 Once you've seen Double Falls it is less than a mile to Tumalo Falls and then only .2 to the parking lot. 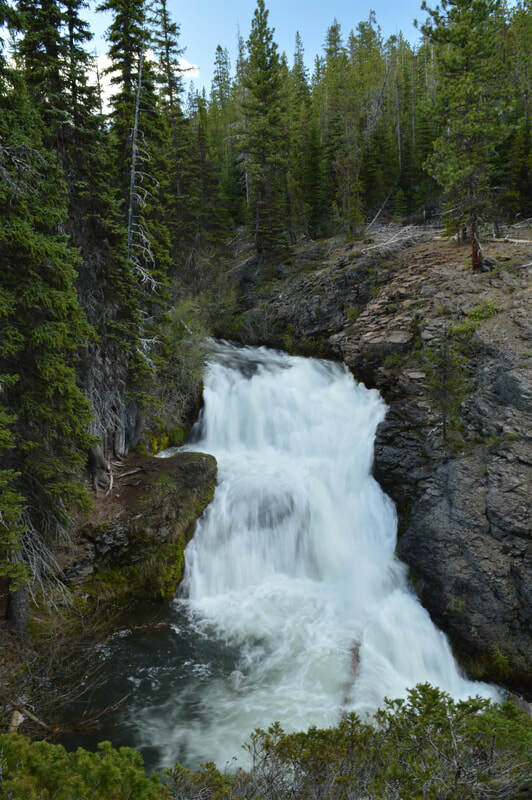 Tumalo Falls has two viewing platforms, one right above the falls, so you can watch the water go over the edge, and one a little bit further down so you can see the falls and a little bit of the creek as well. 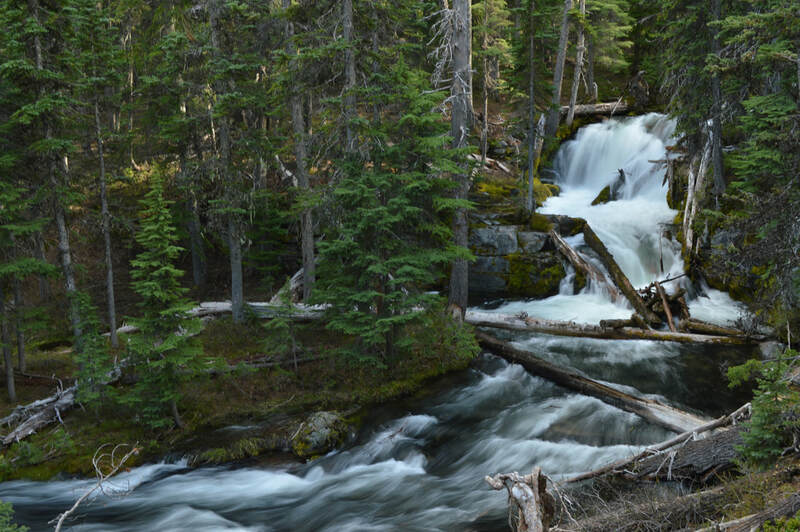 ​Tumalo Falls is 98 feet tall and is absolutely beautiful in any season. The valley that the river creates here really adds to the spectacular beauty of the area. 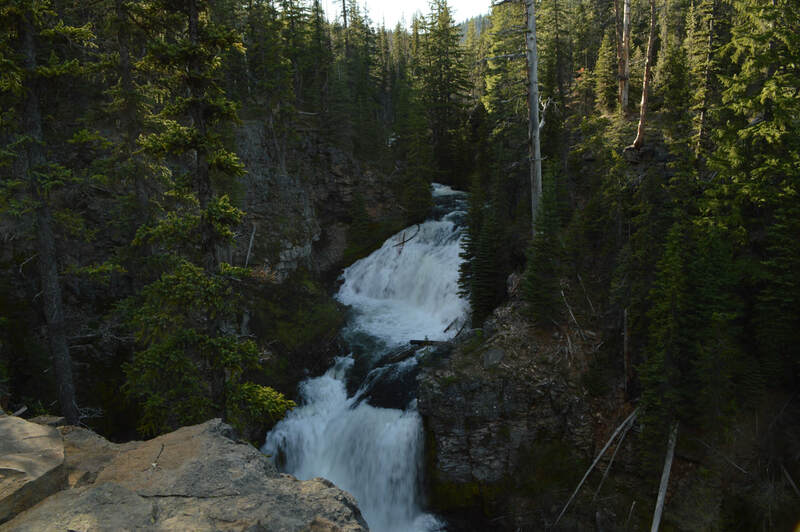 Overall, the Tumalo Falls to Happy Valley loop hike is absolutely amazing and perfect for those who want to get away from the crowds that swarm the Tumalo Falls lookout platforms. It is rated moderate because of the distance, elevation and the slight exposure risk that parts of the trail have, as well as the possible river ford/crossing. 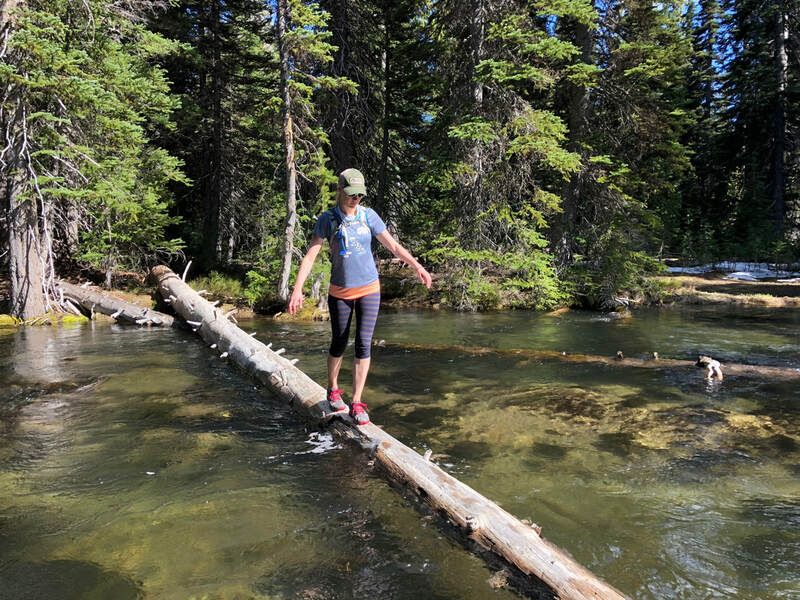 If you do this loop with younger children, it is recommended to do it a bit later in the season when the creek is easier to cross. 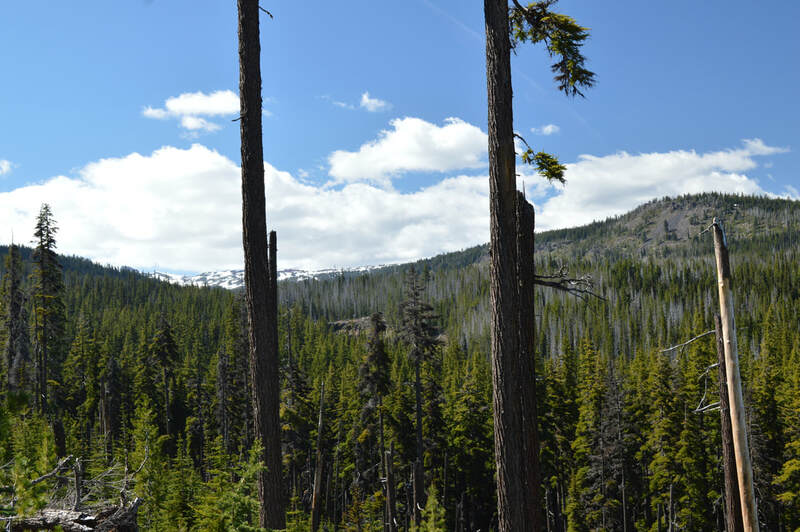 Suggested seasons: Spring, summer, fall (hiking) winter (snowshoeing or cross-country skiing to Tumalo Falls lookout platform only). 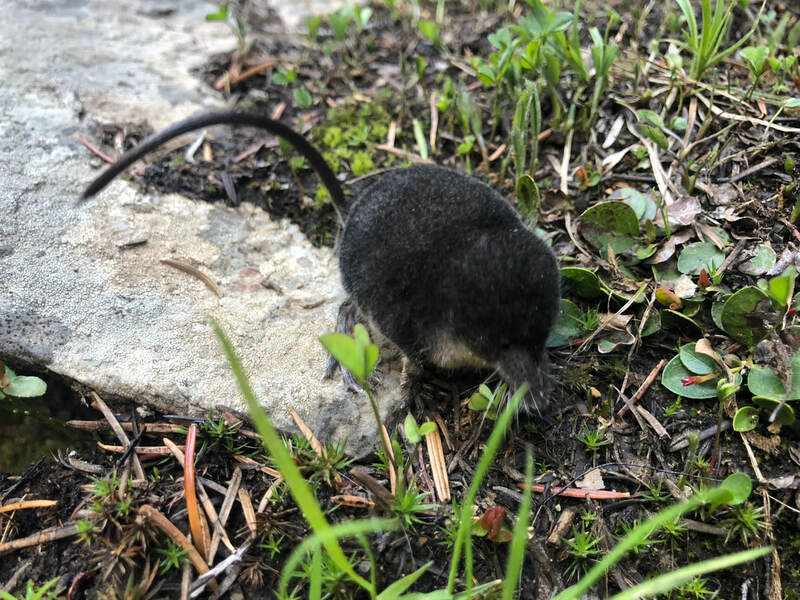 ​(This trail has its perks in the early season (May) because you get to hike without mosquitoes and you will see early wildflowers, but you might also have to hikes through some patches of snow. In mid-June and July the wildflowers are in full bloom but you also have to deal with the mosquitoes. In mid-July and August there are many, many people here and it's not the best hiking atmosphere. September and October is when the tourists start to die down and you will get some beautiful late season coloring here but the waterfalls won't have much flow to them). Trail usage: ​Very heavy in the late spring and summer on weekends, moderate on weekdays and in the late fall and winter on weekends. Directions: From the heart of Bend drive on NW Galveston Ave. which turns into Skyliners Rd. just after NW 17th Ave. Stay on Skyliners Rd. for 8.7 miles then make a slight right onto Tumalo Falls Rd. for 2.6 miles to the parking area. (Total 13.5 miles). ​You will need your Annual State Park Pass, or pay $5 for parking if you don't have one. ​To get directions and mileage from Medford, Salem, Eugene and Portland click here to get the printable version.